Bicyclists in Cambridge get a new light on Western Avenue between Massachusetts Avenue and Memorial Drive. If it was going to happen, it was going to happen in Cambridge. 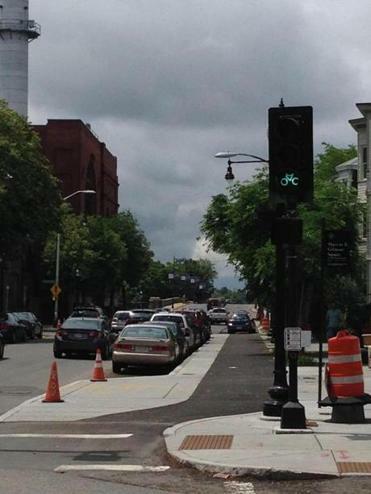 In recent weeks, a new traffic signal has appeared on Cambridge’s Western Avenue, between Massachusetts Avenue and Memorial Drive, to accompany the new separated cycle track recently finished in a round of construction. What makes this signal special? It’s specific to bikes, and each of the lights on the signal shows a little red, yellow, or green bicycle to indicate exactly when cyclists are expected to stop or proceed through the roadway. It is the kind of thing that has become much more common in bike-crazy European cities such as Amsterdam and Copenhagen, or in hippy-dippy US counterparts like Portland, Ore., or Austin, Texas. Now, the People’s Republic of Cambridge appears to be wading into these experimental traffic engineering waters. “Only in Cambridge,” wrote Edgar Dworsky, a resident who lives a few blocks away and e-mailed to point out the existence of the new signal. The new Western Avenue bike signal is not the first traffic light in Cambridge installed for the sake of bike riders. The city has two other bike-specific traffic lights — one in Harvard Square, the other in Porter Square — that both aim to help cyclists turn left safely at dicey intersections. But both those traffic signals feature regular round red, yellow, and green lights, with a sign that indicates that they are meant for bike riders. It may not be long before residents see more of these signals — and not just in Cambridge. Boston officials say they are looking to install a bicycle traffic light in the near future; the idea is included in Boston Bike Network Plan, a blueprint released last year that outlines the city’s long-term plans for bike infrastructure. A phone call to the Registry of Motor Vehicles usually entails a lengthy wait on the hold line — or, at least, a callback from a customer service representative that arrives at a surprise moment later in the day. Now, there’s a new option: Motorists seeking a phone conversation with a member of the RMC staff can make an appointment in advance. No waiting. No surprise phone calls. Registrar Celia J. Blue discussed the RMV’s new initiative at last week’s Massachusetts Department of Transportation board meeting; so far, she said, the appointment option had been successful. Customers set up the initial appointment over the phone, and they can choose an appointed phone call time anytime within the following five days. So far, 323 people have opted to schedule an appointment over the phone. About 60 percent of those appointments were successful, Blue said. In the rest of the cases, RMV officials made multiple phone calls to the customer but were not able to connect, she said.